As this year’s flu season tears through the country, the American River College Health Center is advising students to get their flu shot. Michele Arnott is a college nurse at the Health Center and spoke with the Current through an email interview. According to Arnott, the Health Center refers students to the Centers for Disease Control and Prevention website for information on flu information and prevention. In response to the recent media buzz, Arnott said that people should be concerned about the flu every year. Getting a vaccination can also protect those around you, according to Arnott, especially those who are more vulnerable. Recent studies have shown that vaccines can be about 40 to 60 percent effective in reducing illness during seasons when the shot is a good match to the circulating virus, according to Arnott. Getting a flu shot may also reduce the duration and severity of flu symptoms if someone still gets sick, according to Arnott. According to the CDC, the flu is spread through small droplets made when someone who is sick coughs, sneezes or talks. These droplets can land on people and objects up to 6 feet away. Arnott said the virus can survive on objects for 24 hours. “Routine cleaning of surfaces, frequent hand-washing, and coughing into your arm/covering your cough should reduce the chance of spreading the flu,” she said. According to the CDC, anyone, including healthy people, can get the flu. People with chronic medical conditions like asthma, diabetes or heart disease, people over the age of 65, pregnant women and young children are at a higher risk of developing serious flu-related complications. Carissa Polk is a nursing student at ARC and says she is aware of the severity of this year’s flu season. She got her flu shot in November. “I actually had never gotten my flu shot. Probably as a kid, but as a teenager and adult, I hadn’t gotten my flu shot,” Polk said. Her 2-year-old son also received his first flu shot this year. Polk says while her son hasn’t had the flu this year, her grandma has. 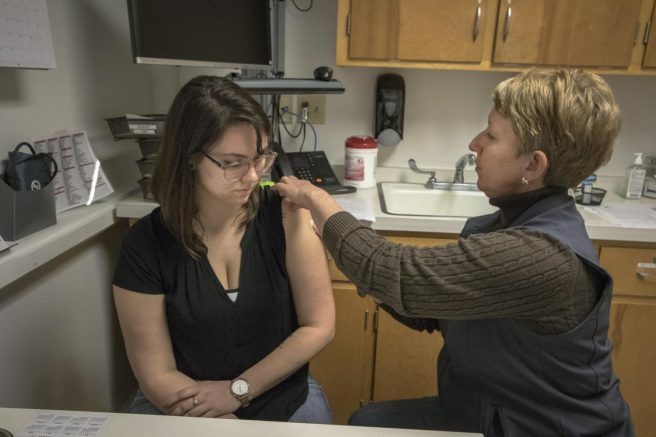 The campus Health Center offers a very limited number of free flu vaccinations to currently enrolled students on a first-come, first-served basis. More information can be found on the Health Center’s website. Be the first to comment on "With flu season here, experts advise people to get vaccinated"